We have just returned from an amazing stay at CLC World, Alpine Centre, Austria. Located an hours drive from Salzburg, it is in a perfect location for a fantastic family winter trip. 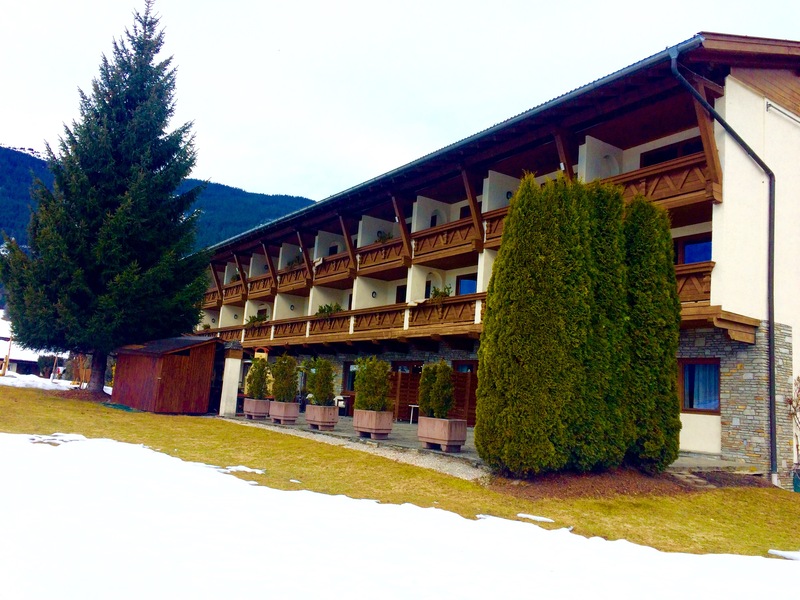 The hotel is surrounded by beautiful snow-capped mountains and plenty of activities for everyone in the family. It’s just a short drive to Zell am See, a pretty Austrian town based around a picturesque lake. We stayed at the Alpine Centre for four nights but I feel we could have done with another two days to squeeze a little more in. A week seems like a perfect amount of time to enjoy all amenities the hotel and local area has to offer. Most guests staying at the Alpine Centre seemed to be on a ski trip of some description. My husband did some snowboarding and our daughter had her first experience on skis. It was so handy to have a ski hire shop on site for all our needs. We rented our gear the evening we arrived in preparation for a morning on the slopes the following day. Travelling with ski gear as well as luggage and a child is in the ‘too hard’ basket, so we were grateful to have everything there! The hotel had a traditional Austrian feel which we loved. 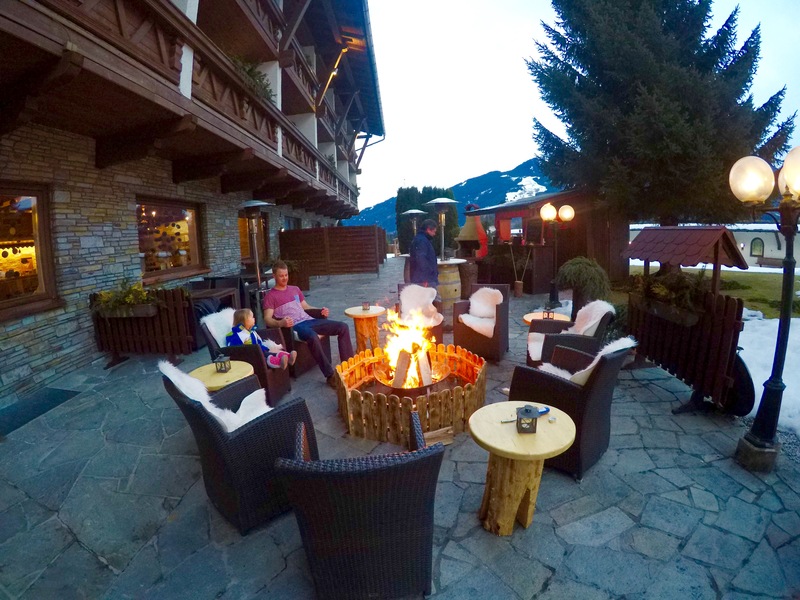 From the incredible views of the mountains to the fire pit out-front where guests huddle around in the evening with a warm drink, it was such a special experience! Here is everything to know about the Alpine Centre from food, to onsite activities! 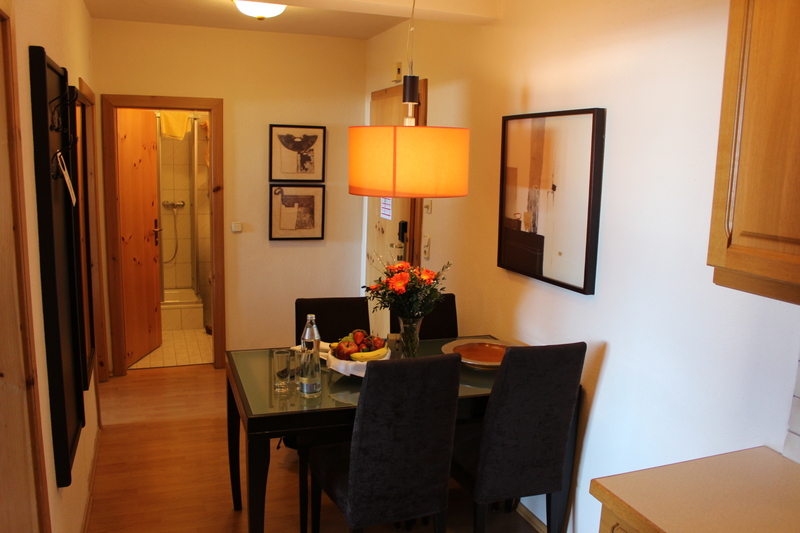 The hotel has a traditional Austrian dining room where all guests can have breakfast or dinner. The views from the dining room of the nearby mountains are stunning. I loved all of the pine cones hanging from the windows. 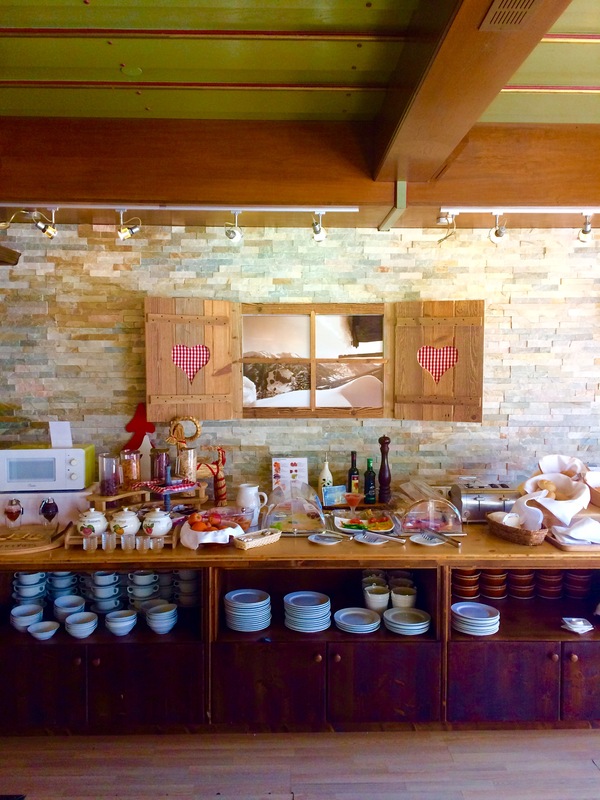 Breakfast was served in a buffet style with a selection of breads, pastries, bacon, bean, sausages, yoghurts, cereals, muesli, tea, coffee and juices. The staff always asked if we needed anything extra, like eggs cooked a specific way or warm milk for our daughter, they were so attentive! We had dinner in the hotel one of the evenings. They had a special Austrian menu which included soup, salad, a platter of meat and vegetables that my husband and I shared as well as dessert. Alternatively, there is an a La Carte menu with a variety of options that are equally as good. They also have a kids menu and they always provided colouring in at dinner time which is handy to get throughout meal times with a two year old. The restaurant formally opens at 7pm, however they were completely flexible with making Esme a kids meal a little earlier. The hotel also serve afternoon tea and even have a movie night deal. They have a long list of movies that can be rented along with snacks such as popcorn, pizza, chicken nuggets and burgers. This a great option if you fancy a cosy night in after a big day on the slopes. All apartments onsite are equipped with a kitchen so there is an option to cook for yourself if you prefer. There are plenty of nearby supermarkets to stock up on supplies. The bar had a selection of draft beers (which hubby loved) as well as good wines, cocktails and soft drinks. I loved how they serve evening drinks with peanuts. Guests hung out in the TV room relaxing in front of the fire after a day of exploring, whilst the kids played board games. We always felt so chilled out in the evenings! Our favourite part of the entire trip was the welcome night! The staff set up a fire pit (gated off for little ones of course). All of the chairs had blankets, it was super cosy! They have a little cabin where they served warm mulled wine and beer. Traditional Austrian music was playing and everyone huddled around the fire to self-cook sausages whilst chatting to other guests. Esme actually ate her dinner that evening, a very rare occurrence so I’m guessing its because she cooked her own meal with a little help and guidance from us. Welcome night is on a Saturday when most of the hotels guests arrive for the week. We stayed in a one bedroom apartment, complete with a kitchen, bathroom, living room, separate bedroom and a massive balcony with great views! The kitchen was fully equipped with all of the appliances including a dishwasher. I love how the hotel left us a lovely fruit basket and all of the basics such as milk, bread, juice and butter to get us started. They are all the little things that make a huge difference when you arrive after a long journey. 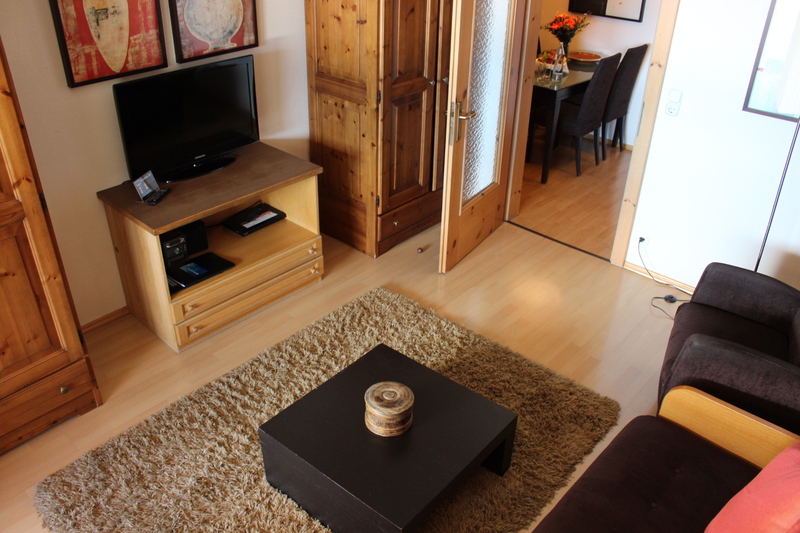 Although we were in a one bedroom apartment, we still managed to have a separate room from Esme which was a huge bonus! In the living room, a bed folded out from the wall. It was super comfy and meant we weren’t disturbing our little one when we were ready for bed. Our favourite hotel amenity was the incredible swimming pool. The water is super clear because of all the light flowing in from the ceiling to floor glass windows. The snow and sun from outside reflect off the water! We had hours of fun playing around in the pool. There is also a sauna which is popular amongst skiers to relax their muscles after a day on the slopes. 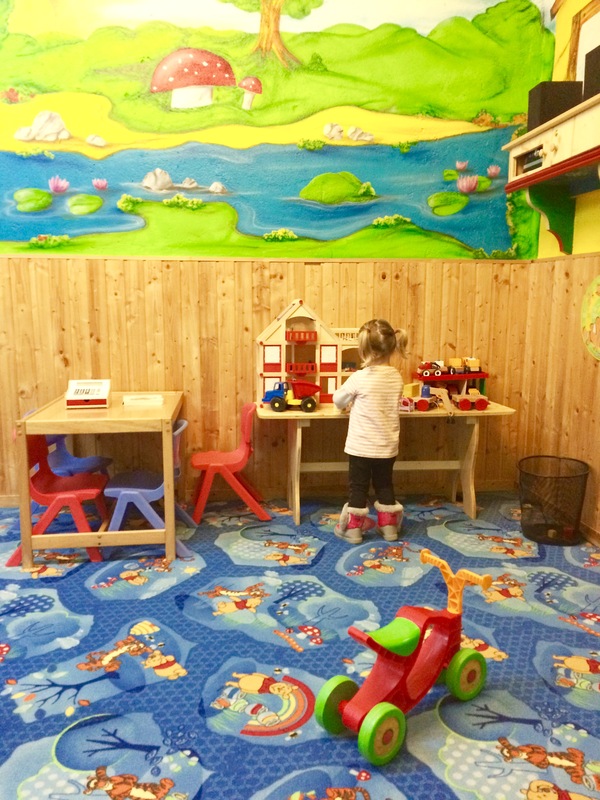 There is a kindergarten room specifically for younger children filled with toys, a ball pit, wendy house a slide and lots of things for drawing. The room is super colourful with murals on the wall, Esme loved hanging out in there. Outside, there is also a pond that kids can skate on if the temperature is cold enough. For older kids, there is a games room with table tennis, dart board and snooker table. As previously mentioned there is also a TV room with board games and a beautiful fire (safe for little ones to be around). 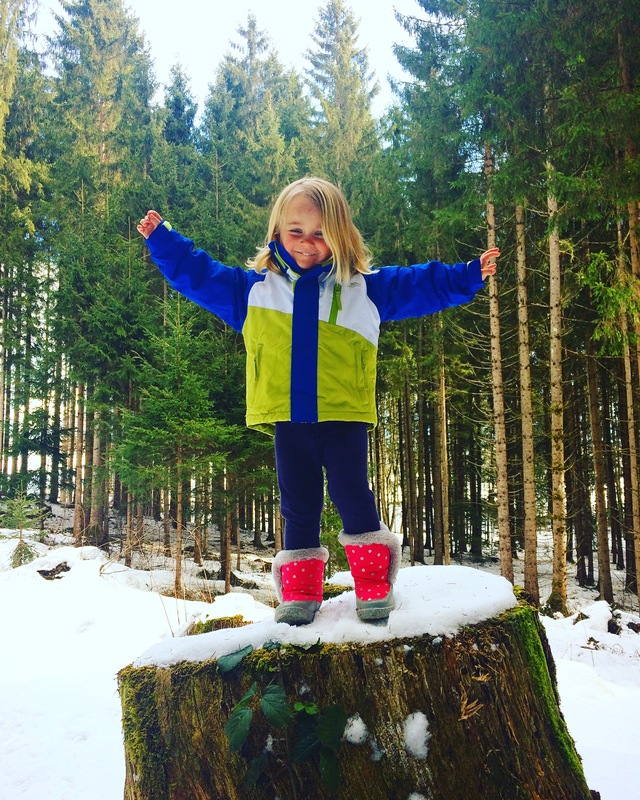 Ski lessons can be arranged for those above three years-old with the Alpine Centres very own instructor. They usually take place on a Monday. We always tend to incorporate some time into our trip for ourselves. My husband and I both had a massage at the Alpine Centre and it was amazing! It’s always good to escape little ones for an hour to have some relaxation and pampering. We both had the full body massage. Behind the hotel is a walking track through a pine tree forest. It’s not too long so it’s a perfect activity with a little one. Esme and I walked through and found lots of pine cones as well as animal foot prints. At the end of the track there is the most incredible view of the mountains on the horizon. There are a couple of picnic tables along the way if you fancied taking lunch, I definitely recommend taking this short but picturesque walk. The Alpine Centre can arrange a number of excursions from a day trip to Salzburg, to an outdoor spa experience. They also offer transfers with their mini-bus or you can rent a car on your arrival to Austria. 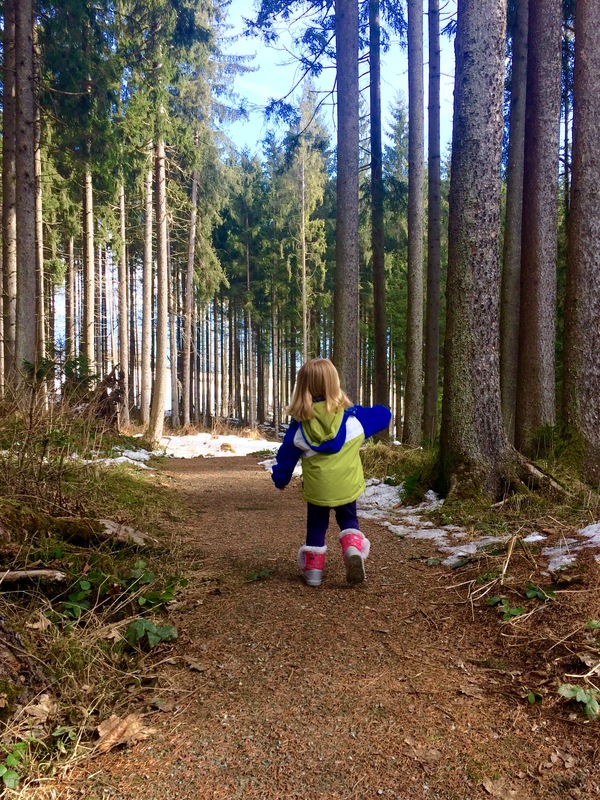 Keep an eye out for our upcoming blog ‘A winter trip to Austria with Kids’ for all the info on what we got up to in Austria. 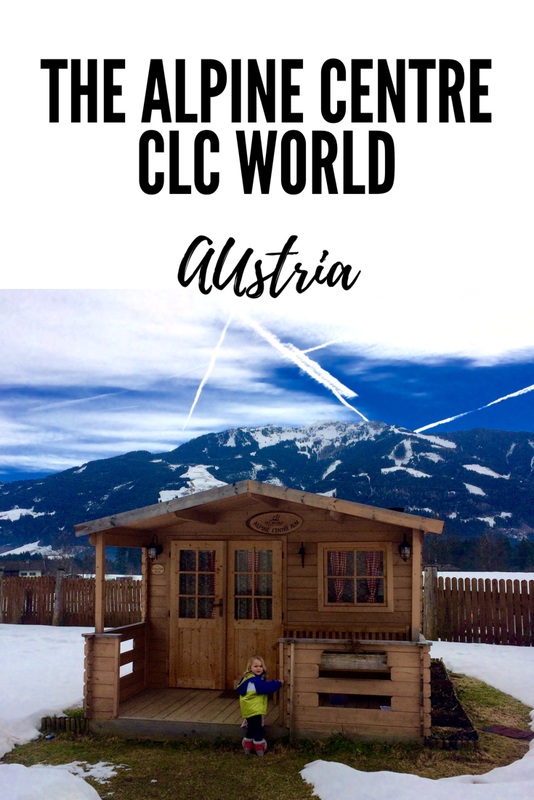 Disclaimer: We stayed at CLC World, Alpine Centre Austria complimentary in return for a review. We covered our own flights. All views and opinions expressed are my own. Thank you so much to the staff, you were incredible!